Some recipes come and go... but other recipes stay around for a long time. These are called family favorites. They remind us of special events or family gatherings. When talking about food with family members, you may have found yourself reminiscing, saying something like, "Do you remember when grandma would make that chocolate cake with the real fudge frosting?" Of course, you don't remember grandma's chocolate cake with fudge frosting; the family has gone nuts trying in vain to duplicate it. Chances are you do have special remembrances of a recipe from your family that you can't find or don't know how to copy. I was recently reading a book about a woman, who after going to" Fanny Mae's Cooking School" back East, broke off her engagement and went to cook for a rancher and his hired men in Wyoming. She took her measuring cups, spoons and lots of spices with her. Her fancy recipes were not appreciated by the rancher or the hired men. But as she began preparing the foods that they were accustomed to, she became loved and appreciated. There is much more to the story, but I just wanted to share that tiny bit. I was always told that "a way to a man's heart is through his stomach." Old cookbooks would often say; a pinch of this; a half a hand full of that, and so on. A couple generations back, women made the same recipes over and over again and knew by look, feel and taste when the food was done correctly. I have to have my measuring cups and spoons when I bake. My mother, on the other hand, never owned measuring cups or spoons and had no desire to have them. She was an excellent cook but I couldn't get a recipe from her to save my life because she didn't have specific measurements. I did learn a lot by watching her. I wish I had been paying more attention when my husband's mom made a cake. She made a chocolate cake with real fudge frosting at the request of everyone in the family for their birthdays. The frosting recipe was in her head and she knew when it was just the right consistency. Now grandma is in heaven and none of us know how to duplicate that cake. I guess what I am trying to tell you is that you really need to keep track of special recipes. I can't think of a better way to keep track of "Family Favorite Recipes" than exporting then into your own cookbook on DVO Cookin'. That's what I'm doing! When I asked my family what their favorite foods were growing up, this is what they came up with. Mix all the above ingredients together and let sit for one hour. Mix all these ingredients into the first set of ingredients. Let sit for 1 hour. This is very soft dough. Make sure your board is covered heavily with flour. Roll out in rectangles. Cover inside of rectangle with melted butter and cinnamon sugar. Roll and slice with a sharp knife, a string or dental floss. Cook at 350 degrees in preheated oven for 35-40 minutes. While the rolls are still warm frost as desired. This dough can also be refrigerated covered for up to 3 weeks. 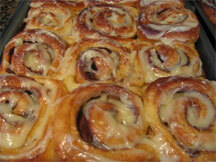 You can also make cinnamon roll dough and freeze. Take out and let rise (this will take several hours if frozen). My other daughter and her family can't get enough of her pancakes. Actually, if I want to please any grandchild this will do the trick! Add dry ingredients together and then add the wet. The baking powder and buttermilk make them so light and fluffy. If you want them even fluffier, separate the egg and whip the egg white. Fold in carefully just before cooking. Cook on your electric skillet according to its recommendations. If the pancake mixture is too thick; thin with water. This recipe can be multiplied as much as need. When the girls were making cornbread tacos, I wasn't sure I was going to like them much. They were terrific! Just make your favorite cornbread recipe. Slice the cornbread in the middle onto a plate and add any ingredients you would use on Navajo tacos. One of the nice features of this recipe is that you can have the cornbread prepared ahead of time, as well as the other ingredients. This makes this dish super easy to put together. It's been so long since I have made sweet and sour pork that I can't find the recipe. This just goes to show you how important it is to keep track of those well loved "Family Favorites." Whisk together the soy sauce, sugar, 2 teaspoons corn starch, sesame oil, and black pepper in a large bowl. Mix the pork into the marinade and turn until all the pork is covered. Allow to rest for 15 minutes. To make the sauce, whisk together the water, vinegar, ketchup, sugar, salt, corn starch, and red food coloring in a separate bowl. Set aside. Dip the pork pieces in the beaten egg, and then dredge in the 1 cup corn starch. Use your hand to press the starch onto the pork, assuring a consistent coating. Heat the peanut oil in a wok over medium-high heat to a temperature of 375 degrees F.
Well, there were more than this, but this is what some of them came up with. It's a wonderful reminder to me why we should create our own cookbook. I've' also learned not be afraid to try something new once in awhile. My brain might be saying "Oh no!" But, my mouth might just say "Oh yes!" And, it might even become a "Family Favorite."